Do Not Waste Time - Place Your Order Now Before We Are Sold Out Again! The unique, finest quality natural ingredients blend is extremely potent, providing you with immediate, visible results. The L-Carnitine, L-Ornithine, L-Arginine, Chromium, African Mango, Grapefruit powder, Green Tea leaf extract EGCG, Panax Ginseng, Maca powder and Grapeseed extract blend just to name a few, is bound to work wonders for you and your body. These weight loss drops will boost your metabolism, helping your body burn fat at a faster pace. The drops should be placed under the tongue. In addition, it will help you absorb nutrients and flush fat away. What is more, it will help you control your appetite and get rid of extra pounds while protecting your lean muscle. 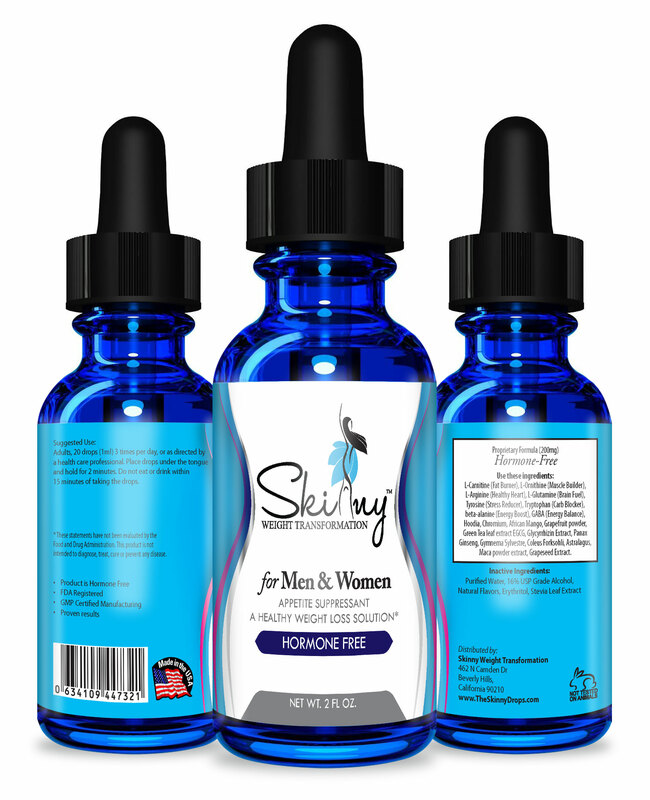 These fat burning, hormone free diet drops are extremely easy to use. All you have to do is take 20 drops, 3 times a day. You simply place them under your tongue and hold them for about 2 minutes. You also have the option of swallowing or spitting the drops out. Lose Weight And Acquire A Slender, Attractive Figure Thanks To The Best Weight Loss Drops! Forget about cheaply made, HCG homeopathic weight loss drops that might cause unpleasant side effects. 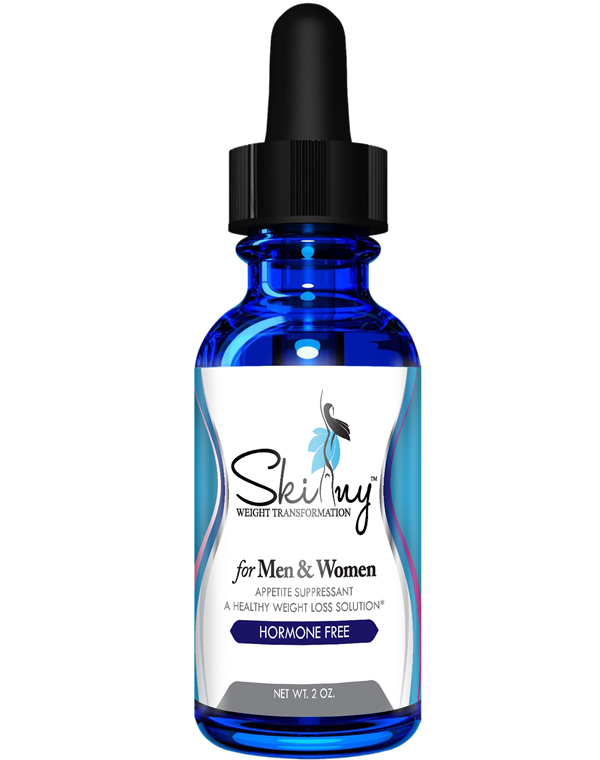 The Skinny Weight Transformation hormone free diet drops are the result of 20 finest quality, pure fat busting ingredients blend that will cause no harmful side effects while helping you transform your body and stand out thanks to your flawless figure. Make these hormone free, appetite suppressant drops yours now and lose up to 1 pound a day without struggling for hours at the gym. The incomparably effective, proprietary blend has been proven to provide unmatched results, helping you acquire the figure you have always dreamt of. Apart from losing weight, these safe and fast diet drops will help your body in a variety of different ways. They will support healthy skin, muscles, liver and immune system. They will also help you control your appetite and burn away fat. These liquid fat burning drops are very easy to use. You simply need to take 20 drops, 3 times a day. Place the drops under your tongue and hold them there for 2 minutes. Then swallow them or spit them out. You are advised not to drink or eat anything for 15 minutes after using the drops. Meeting all your demands and providing you with the friendliest customer service is our primary goal. This is why we offer you a 60 days money back guarantee in case these weight loss supplement drops do not live up to your expectations. Skinny was founded because of two high school sweet hearts who were overweight all throughout High school. They tried many different weight loss products with no success. While continuing college they studied there interest, her degree was fitness and nutrition and his degree was in chemical engineering. Both still struggled throughout college with their weight, wanted to find an all-natural organic sustainable, easy to maintain weight loss solution. She wrote a dietary fitness plan along with suggested recipes for a better eating lifestyle based on her nutritional fitness degree. With his chemical engineering background, he was challenged to develop a proven organic all-natural easy to maintain appetite suppression formula. After a few years into there masters degree program and many trial and errors, they have successfully developed a solution to the ultimate weight loss challenge! Skinny Weight Loss Transformation was developed. Adults, 20 drops (1ml) 3 times per day, or as directed by a health care professional. Place drops under the tongue and hold for 2 minutes. Do not eat or drink within 15 minutes of taking the drops. Please download and follow the FREE Receipe eBook Below. L-Carnitine (Fat Burner), L-Ornithine (Muscle Builder), L-Arginine (Healthy Heart), L-Glutamine (Brain Fuel), Tyrosine (Stress Reducer), Tryptophan (Carb Blocker), beta-alanine (Energy Boost), GABA (Energy Balance), Hoodia, Chromium, African Mango, Grapefruit powder, Green Tea leaf extract EGCG, Glycyrrhizin Extract, Panax Ginseng, Gymnema Sylvestre, Coleus Forksohli, Astralagus, Maca powder extract, Grapeseed Extract. Copyright 2016 . All right reserved.